The ability for soldiers to identify, process, comprehend — and to clearly communicate — critical information in a combat environment is key to their safety and mission success. Q: What do you feel is the role of intelligent hearing protections and communication systems, such as QUIETPRO® QP400, in the Special Operations Forces? A: Hearing is a critical part of combat. Combat is an extremely noisy environment where hearing is constantly assaulted. For example, a single IED explosion can cause permanent hearing loss and render soldiers ineffective to themselves and their unit. In most cases, the U.S. military, and especially the U.S. Special Operations Forces, fight at night where even with advanced night optics the sense of sight is limited. Hearing is the one sense that is with you all the time and is very dynamic. 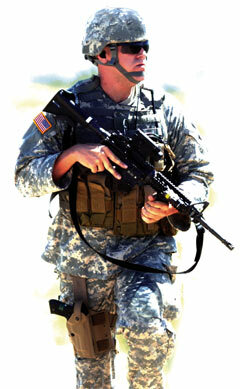 Anything you can do to protect and enhance hearing is a significant combat multiplier. Combat noise is unpredictable and can happen at any moment. The QUIETPRO QP400 from Honeywell First Responder Products is constantly on — monitoring the environment in the background without the wearer having to do anything. Its advanced electronics and patented technology allow the soldier to not only hear naturally without hindering critical aspects of sound perception such as localization and directionality, but also provides bionic hearing that enhances hearing capability when needed. In combat use, U.S. Marine Corps sniper teams reported the ability to hear, locate, and identify targets out to 300 meters when using QUIETPRO. A U.S. Army sniper who had a situation in Afghanistan when a Taliban patrol was able to get close to his position stated that if he had access to QUIETPRO, he would have been alerted to the enemy. When I served as a soldier in the U.S. Army, there were many times when on patrol where I would stop, close my eyes and listen to the environment to gain better situational awareness through my hearing. Q: How do products like QUIETPRO QP400 better enable soldiers? A: QUIETPRO QP400 becomes an extension of the soldier. It is always on and always ready, seamlessly acting as a protective and enhancing force supporting mission accomplishment and readiness. Another prime benefit of QUIETPRO QP400 resulting from its superior hearing protection is its extremely clear communications. Simply put, it picks up one’s own voice transmission from inside the ear canal. QUIETPRO QP400 uses air conduction microphones that are in the ear tips seated in the user’s ear canal. The seal provided by the foam eartip isolates sound inside the ear canal, providing a very quiet, clear environment for outgoing communications that are picked up in the space in front of the ear drum. It also uses digital signal processing that synthesizes both incoming and outgoing voice communication to ensure clear traffic. Q: Can you give some examples? A: Bionic hearing helps soldiers not only better hear but better understand and comprehend what they are hearing. A Special Operations Forces team was using the QUIETPRO during a non-explosive breach of a suspected enemy building. The #1 man in the five-man stack was able to hear movement behind the door prior to the breach by turning up the ambient sound feature of his QUIETPRO. This allowed his unit to enter the room with better awareness of what was going on inside the room. When soldiers are exposed to dangerous noise like explosions they can become temporarily disoriented. U.S. Army Maj. Jack Moore, an Infantry STRYKER Company Commander in Iraq, was wearing his QUIETPRO in the hatch of his vehicle when the enemy attacked with RPGs. Even when the rockets hit his vehicle, his QUIETPRO protected his hearing and allowed him to maintain his situational awareness and fight while remaining within his vehicle. He has stated that QUIETPRO not only protected and maintained his hearing, but because of that situation he believes it saved his life. Q: Since the release of the original product line, how has QUIETPRO been adopted into the armed forces / special forces? A: The U.S. Marine Corps is an early adopter of the QUIETPRO technology. In response to an immediate need for hearing protection and communications systems, the Marine Corps Systems Command conducted rigorous tests and evaluations of a variety of TCAPS — and twice selected QUIETPRO to be the hearing protection headset component of its Integrated Intra-Squad Radio (IISR) program. This program provided squad radios down to the individual Marine Rifleman. With the introduction of QUIETPRO as its intelligent hearing and communication system, the Marines were able to change the way they trained and executed close combat tactics, techniques, and procedures. U.S. Army Program Executive Office Soldier (PEO Soldier) adopted the QUIETPRO as Government Directed Equipment for the Land Warrior and Nett Warrior Programs. The program office also tested and evaluated the QUIETPRO for its Tactical Communications and Protection Systems (TCAPS) program and designated the headset in the “Best” category. Q: What separates QUIETPRO QP400 from other TCAPS? A: QUIETPRO QP400 offers a digital platform where as other systems use analog signal processing. Digital processing allows the system to have an extremely high response time to protect the user against dangerous noise. QUIETPRO QP400 samples sound approximately 16,000 times per second and reacts to an event in less than one millisecond. This ensures a high level of uninterrupted protection while allowing the user to maintain complete situational awareness. QUIETPRO QP400 also has multi-channel communications ports for tactical communications devices and a dedicated port for mobility platforms. This allows the user to maintain connections to up to two single tactical handheld radios. QUIETPRO QP400 has a third audio input port to accommodate ancillary devices such as gunshot detection, voice translation systems and even MP3 players, iPods and other audio systems. QUIETPRO QP400’s proprietary digital technology also provides adaptive Digital Active Noise Reduction (dANR). This provides continuous protection against dangerous low frequency noises that, over time, can cause noise-induced hearing loss (NIHL) and lead to a soldier’s medical reclassification and possible discharge. In effect, this would reduce unit readiness if an experienced soldier had to retire from the service early. Such retirements are also a contributing factor to the increasing cost of disability pay for hearing loss – even more importantly – represent a reduction in the quality of life for soldiers following their service to our nation. Finally, the QUIETPRO QP400 Control Unit has been redesigned with soldier ergonomics and adaptability foremost in the engineers’ minds. For example, the control units are now better suited to the rigors of combat. All of QUIETPRO QP400’s menu push buttons are easy to press. A new voice feedback menu provides immediate feedback on the soldier’s function and set-up. Its radio and headset connectivity is more flexible than before. All connectors have a quick disconnect capability. It also now supports multiple headsets. Soldiers can choose between QUIETPRO’s Soldiers can also choose between QUIETPRO’s in-ear high noise protection headset, legacy circum aural earmuff headsets, or legacy low-profile – as well as convert non-hearing protection systems available from other manufacturers.